The master piece of Tarantino split into the two main plots, chronologically ordered for a new watching experience. Now you can decide if you want to watch Butch's movie or Vincents movie. Pulp Fiction is a perfect movie, it cannot be improved. So what we did is just to give you a different view on the main story lines by telling them chronological and split to two movies instead of one episodic movie. Now you get the full story of Vincent Vega (in which he won’t die) and the full story of Butch Coolidge (in which Vincent will die). A few scenes had to go for context reasons. Ringo and Yolanda’s beginning had to go, because the scene was overlapping with Jules and Vincent entering the coffee shop. Also gone is Vincent and Marvin entering the boxing arena. Some other scenes had to be shortened or just matched to contents. What you now get is two complete stories, all chronological and both just about one day in the life of the main characters. It works very well and the interesting thing about this edit is that it changes the atmosphere for several of the so well known scenes. We did not improve the movie a single bit, but we gave you, the audience, the chance to decide for a story to watch. The idea for this came from the director’s cut edition of SIN CITY. - removed Vincent and Marvin entering the boxing arena to meet Marcellus Wallace (the scene did not make any sense for our Vincent plot and Butch was not present there. Overall this was a really neat edit. I love Pulp Fiction and blah blah blah. The concept of breaking it up into two movies is inspired yet it lacks a certain X Factor. Narratively it’s a bit of a mess. The Vincent movie has the big finale right in the middle and when you get to Mia’s story it feels like overkill. But both parts tell a complete story and end satisfactorily. Technically it’s a good edit, quality isn’t too great but the editing is solid. 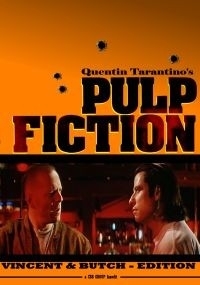 If you love Pulp Fiction and feel like changing things up the next time you watch it I recommend checking this out.